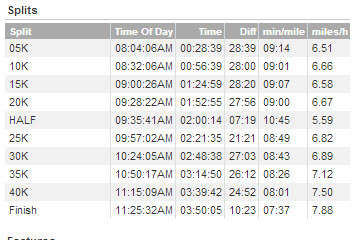 This was Chicago Marathon #7 for me and my 23?ish marathon in total. Was it a PR-no, but damn I felt really good. I really wish I could explain why. I had never run a marathon without officially training for it. I mean following a marathon training program. Was I in shape? Yes Was I capable of finishing? Yes. Yes I had completed an Ironman, a Leadman and a few other races here and there but running a marathon is such a different beast than doing those other events. 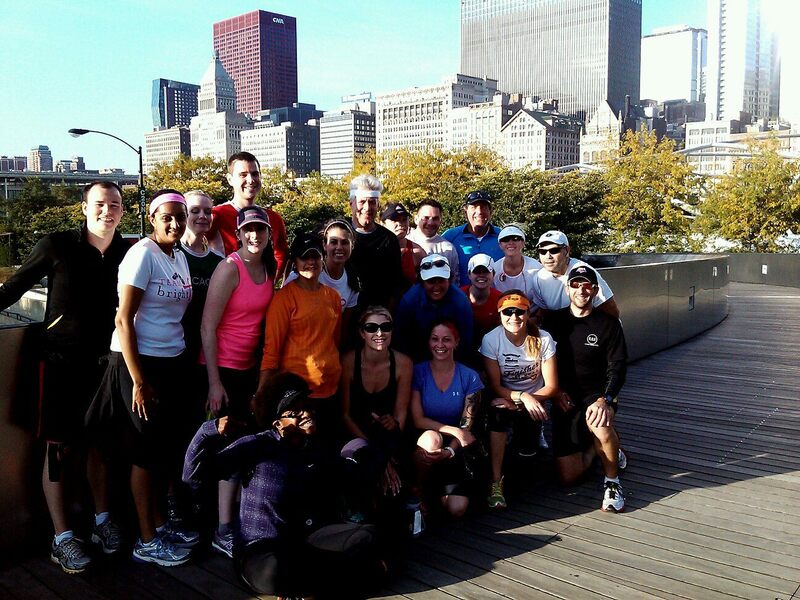 If you don’t carefully pace a marathon that infamous “marathon wall” can hit you hard. So, I had no idea what to expect. I guessed conservatively that I would run between a 9 – 10 minute pace based on some race times and my long Saturday runs I coached. I picked up my race packet on Friday after work then headed out for a post “Leadman” pre”marathon” dinner with Tom. Saturday was the first in a long time I’d actually get to sleep in. Well, despite the late night festivities on Friday night I found myself unable to sleep in. I got up at 6 to do some work. I tried to go to bed later but ended up reading magazines and not sleeping! Sitting around made me feel stiff and sore so decided to get out and do something. I went to the gym to hit the pool and sauna. I swam a few lengths and got my heart rate up for a few. I also did some pool jumping jacks and some pool running. I really felt like it stretched out my muscles. I would highly recommend it. It was just what I needed. I got home and ate various snacks – sushi, a bowl of soup and some leftover pasta. Then headed to bed at an early hour. My alarm did not go off so I bolted up at 5 realizing I had slept in. I got ready and ate my bagel, almond butter and banana with a reduced bolus of 80% with a 238 BG so about 5.5 units. I had been having a rough week with inexplicable late night highs. Perhaps from the lack of working out that week? Tom dropped me off at FFC South Loop, I put my disposable layers on and got to greet all the runners and wish them luck. The temps were to be in the mid-30’s. 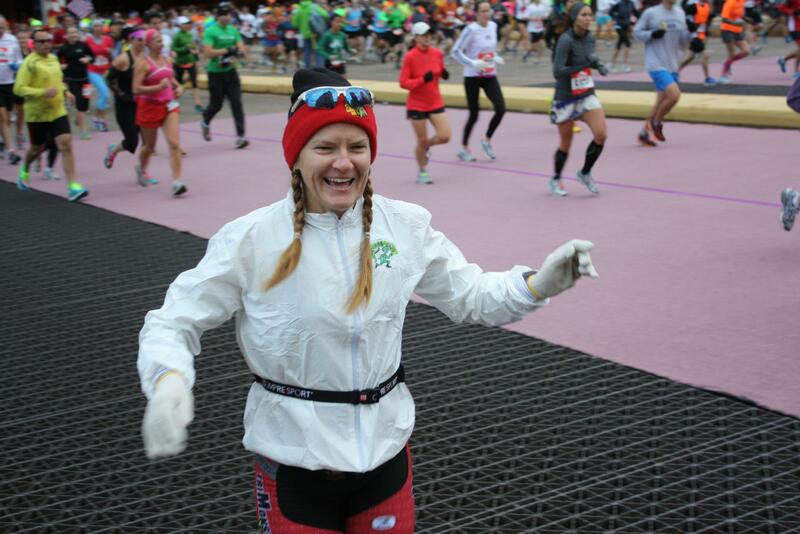 I wore my trimonser triathlon kit with a sheddable jacket then a throw away long sleeved top with a hat and gloves. I packed two packets of blocks, a gel to eat early on in the race, endurolytes and a $20 bill (in event that my plantar fasciitis kicked in or my tight hamstrings gave out or anything else for that matter!). I had my dexcom with me. I decreased my basil to 60%. My plan was to go out easy at a 10 min / mile pace or so then pick it up for the last 13 miles. Hitting the pool the day before does wonders physically and mentally. Biking a lot does translate into running fitness! Proved again that a good pacing strategy works. 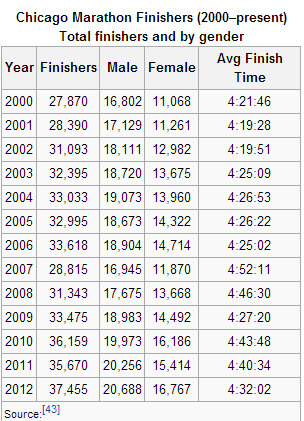 Check out this chart on the average finish times and gender split! I headed back to the gym where all our runners I had coached were going to arrive within the next hour or so. It was the icing on an already awesome cake to see them all arrive one by one and to hug every single one of them. We had spent nearly every Saturday together for the last 18 weeks. They had all worked so hard to get that medal around their necks! I was prouder than punch! Another awesome part of the day was getting to see my TEAM WILD friends! I love love love seeing these guys. I feel so blessed to have them all in my life. 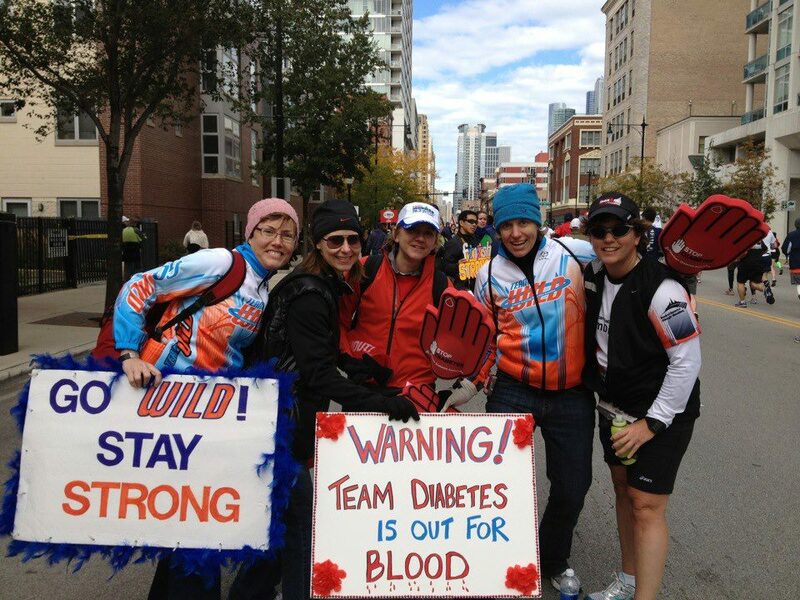 We had all trained together for Ironman Wisconsin, all Type 1 diabetics and 1 Type 3 (10 of us!). We all support each other in our athletic endeavors along with all the Type 1 crap that we deal with each day. We spent the rest of the afternoon drinking bud lights and munching on Pizza watching Da Bears! Great Day! The following couple of days were pretty brutal. I was fairly sore and walked like this:http://www.youtube.com/watch?v=m-hCuYjvw2I my Plantar Fasciitis was pretty bad but feels ok now- a few days later. Next up is the NY Marathon in a little less than a month. My plan for the next few weeks (after this recovery week). Is to do a lot of swimming, some hill work, some speed work and some strength training and no long distances…. we will see how this pans our. This entry was posted in Race Day Tips, Race nutrition, Race Reports, Training, Uncategorized and tagged blood glucose, dexcom, Endurance, health, marathon tips, marathon training, marathon training program, plantar fasciitis, running, Team Wild. Bookmark the permalink. I think you are awesome and getting stronger and stronger each I think New York should watch out!!!! Haha! I appreciate the compliment! Thank you!